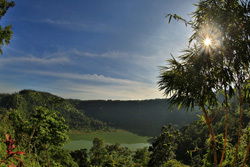 Three lakes with the splendour sunrise formed an attractive tourism located in Lumajang, East Java. The magnificent sensation of the sun would soon be coming. The dark sky turned lighter into blue, red, and golden yellow to be one brightening the Ranu Klakah with the Mount Lamongan on 1,668 meters above sea level as its amazing backdrop. 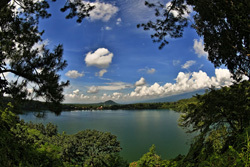 The Mount Lamongan, a maar volcano in East Java, is surrounded by 27 maar volcanoes having diameter 0f 150-700 meters. Some maar volcanoes have some lakes, such as Ranu Klakah, Ranu Pakis, and Ranu Bedali. 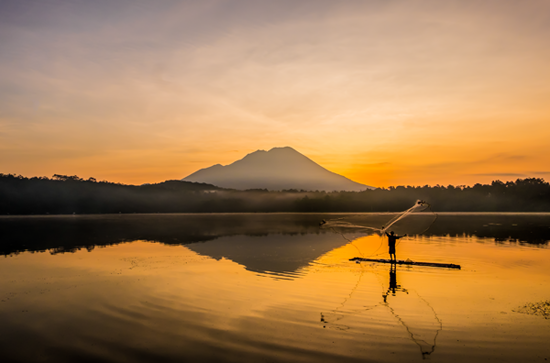 The silhouette of the fishermen turned invisible on the lake. The sun creating line patterns cut by the thick leaves becamea a breathtaking landscape. Ranu Klakah and various activities of the people around it could never keep these eyes away. The hungry little birds were flying around it catching their preys on the lake. Their maneuver of flying on the fishermen's traditional rafts became a wonderful attraction to remember. There are three lakes around the area including Ranu Klakah, Ranu Pakis, and Ranu Bedali. The natural lake tourism, the charming panorama, and the triangle location of these three lakes become a unique attraction. From above, we can enjoy the sensation of the sun as well as the tourism facilities, like speedboat, canoe, jet ski, swan boat, traditonal bamboo raft, and fishing area. You can also have breakfast on the food stalls on the seashore offering various kinds of fish served as you wish. After having breakfast, try to pay a visit on Ranu Pakis. It is 1 km far from Ranu Klakah. The landscape is similar to Ranu Klakah. There are floating places to cultivates freshwater fish and you can interact with the fishermen around here. If you want to see the lake from above, you can come and visit Ranu Bedali. It is 5 km far from Ranu Klakah. Ranu Bedali tourism desination which is 700 meters high upon the see level and 25 Ha wide falling downward is really pretty to enjoy in the morning. The green lake from above will be very beautiful to be seen while relaxing at the small pavillions available around here. The three lakes are located at Klakah district. They are 20-25 km far from the southern of Lumajang. It takes only 40 minutes. From Surabaya/ Malang bus station – Wonorejo bus station – Klakah bus station – to the tourism object. From Jember/ Banyuwangi bus station – Wonorejo bus station – Klakah bus station – to the tourism object.